Just think of a situation where you have the pressure during the admission sessions. As you are already on the peak hours of new admissions and alongside you have to manage other things too like visitors who visited the school, creating new fee structures and criteria, attending every single parent and giving away the prospectus. It becomes just difficult for the school staff to manage all this while attending the daily visitors. Now, what if I say that the parents get all the information about the school while sitting at home? It would be a WOW situation because it would simplify the complete process and make it easy for you to tackle the admission sessions. Isn't it? This is where school ERP systems make an entry. Introduction of school ERP systems have streamlined the complete school tasks in a better way where tasks are carried out in a more smarter and accurate way. Introduction of school management system has become the game changer in the education industry. The manual way of carrying out school operations got transformed and of course, in a better and a smarter direction. And schools have happily adopted SchoolERP as it a one-time investment solution which comes up with lifelong benefits. Moreover, it is just not the school administration which will get benefitted from School ERP system. Rather, even the staff & teachers, parents, and the students will equally benefit from the school management software. In simple words, the school management system will not only streamline the school tasks, but will also enhance the parents, teachers, and the student's communication too. Let's explore more about how the school management system benefits all of us. Easy record management: Instead of managing piles of papers to manage records, school management system lets you automate all the records and manage them without any hassle. Whether it is the fee records or other documents related to school, all of it gets managed accurately with jiSchoolERP. Secure data: Complete data saved over jiSchoolERP is kept safely over its database. Not only this, regular backups are taken to stay on the safer side and be prepared in case of any kind of data losses in the future. Budget-friendly operations: Removing the paper pen concept and spending huge costs over paperwork, jiSchoolERP saves the complete cost and automates all the operations. Mark attendance: Wasting time while marking the attendance of every individual student can be transformed using jiSchoolERP which automates the attendance management for you. Analyze student performance: Keeping a regular check over every individual student's monthly or weekly academic performance becomes easy to manage with jiSchoolERP. Examination records: Managing examination records of every student is made easy and viable with jiSchoolERP. Teachers can analyze every individual marks and prepare mark sheets accordingly. Notes & study material: Students can get the updated notes, daily homework, assignments, project details easily over the panel on a daily basis and stay updated at all times. Better communication: Getting doubts clarified can be made easy as the students can interact with their teachers at anytime even after school hours. Thereby, enhancing their learning experience. Updates: All the important information including date sheets, seating plan, project submission dates, activities & functions, and other details can be received with jiSchoolERP. Track student progress: Keeping a regular check about how the kids are performing in academics becomes easy for parents. jiSchoolERP presents the updated records of students to the parents. Alerts & notifications: Fee reminders, late fee submission, date sheets, and other necessary information is shared with the parents almost instantly via jiSchoolERP. Student feedback: Parents can get their students academic feedbacks from teachers on a regular basis about how their kids are performing in every single subject. So, what are you waiting for? 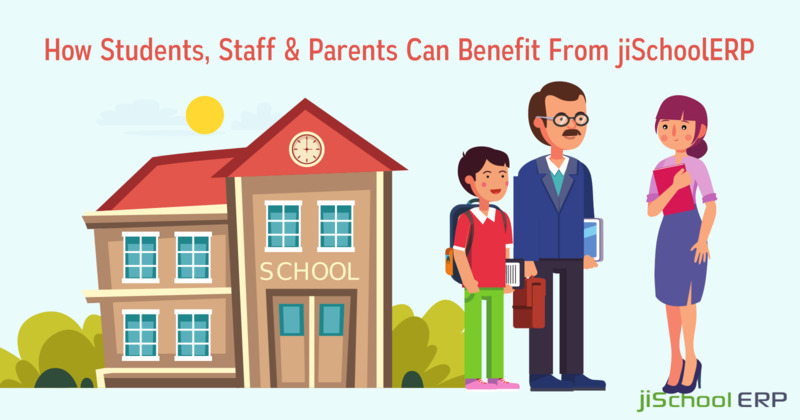 Get the best benefits out of jiSchoolERP and experience a better version of school management. Still not convinced or have any questions? Get in touch with our experts and know more about our exciting features!